On August 1st 2010, the Jewish community of Plantation celebrated a milestone, the addition of a Torah scroll to the Jewish community center. The Torah was donated by Reuben Ezekiel, a local philanthropist, and owner of Fountains Jewelers. The Torah scroll, made of parchment, contains the Pentateuch (the first five books of the bible), and is used during services in synagogues on Mondays, Thursdays, Saturdays and holidays. Every letter in a Torah scroll is hand written by a Jewish scribe, a sofer, who ensures that no letter touches another, and that each letter is perfectly written. According to Jewish law, the entire scroll becomes invalid if even one letter is transposed, missed or redundant. Reuben Ezekiel donated the Torah to the Jewish community center in loving memory of his mother. 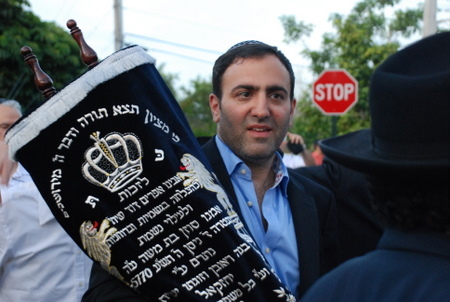 Hundreds of people, including Ezekiel’s family and friends and members of the local community, expressed their joy by escorting the new Torah scroll to Chabad of Plantation’s synagogue, dancing and singing in the streets.